Pete’s Peek | Watch Me When I Kill! 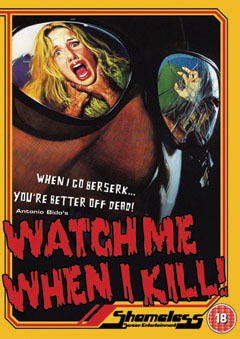 Riding high on the success of Dario Argento’s 1977 heart-stopping classic Suspiria, director Antonio Bido lensed Watch Me When I Kill! Originally titled The Cat with the Jade Eyes, again a nod to Argento’s early thrillers, Bird with the Crystal Plumage and Four Flies on Grey Velvet, Bido’s thriller follows night-club dancer Mara (Paola Tedesco) and her lover Lukas (Corrado Pani) as they try to unravel the death of a pharmacist which Mara had witnessed. Their investigation leads them down a dark and dangerous road, from Rome to Padua, where they attempt to unmask the killer before he strikes again. Bido’s debut feature is an homage to the Giallo tradition, an established art form that originated in Italian crime fiction (usually produced with yellow covers) dating back to the 1930s and in Italian cinema with Mario Bava’s brilliant black and white 1963 masterpiece The Girl Who Knew Too Much. While the plot is somewhat a tangle, it is engaging, and I was glad that the killer isn’t revealed in the end to be just another typical psychopath. The murder scenes are striking, however they do look at bit dated compared to today’s slashers and the performances are well rounded, though the lead actors are not well-known except for Pasolini favourite Franco Citti, who has a small role here as a convicted felon. The star of the film, however, is the Veneto city of Padua, which was also the setting of Shakespeare’s Taming of the Shrew. Bido’s camera work here is appropriately gloomy. The streets are empty, making it appear a ghost town. And the colours, all blue washes, make the city seem dreamlike, adding to the unsettling atmosphere of the film. This Shameless Fan Edition DVD by Shameless Screen Entertainment is a huge improvement on earlier releases. The transfer is the best it can be, considering the poor stock Bido used in making the film. And while I loved the music score by Trans Europa Express, being a huge Goblin fan, I couldn’t help but feel a little cheated by its similarity to Argento’s Suspiria. Still Shameless should be commended for unearthing this giallo gem, which includes a fascinating, though short, interview with the director, alternative opening sequences, trailers and photo gallery.